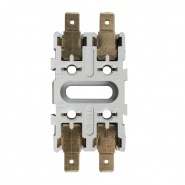 Moulded plastic base for 2 circuit breakers, can be joined together to form a bank, accepts 6.3mm blades with cable 6.3mm blades. 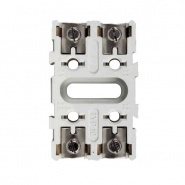 Moulded plastic base, for 2 circuit breakers, can be joined together to form a bank, accepts 6.3mm blades with cable screw terminals. Moulded plastic mounting base for 2 circuit breakers, can be joined together to form a bank, accepts 4.4mm pins with 6.3mm blades. Circuit breaker base types for pin mounted circuit breakers. Two different styles are available, one with pin receptacles and the other with blade terminal receptacles. Bases can be mounted into electrical panels. Moulded mounting base for 2 circuit breakers, can be joined together to form a bank, accepts 4.4mm pins with cable screw terminals.